To play unattended operation, you may concern about the result of backup plans, so this function is very important for you. You can use it to send a report of execution result to the email address you set before. In unattended operations, you may wish to be advised about the results of backup plans. This function can be used to send a report of the execution result to an email address you provide. check “Enable email notification” to set up your email configuration information. 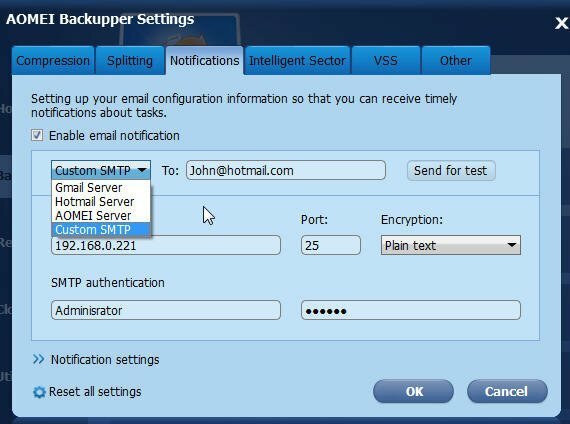 There are four SMTP servers for sending the notification email: HotMail Server, GMail Server, AOMEI Server or Custom Server. When you select HotMail or Gmail, firstly you need to type into an email address which the program will send the execution result to and then you need to input your HotMail or GMail account for the SMTP authentication. So, it will use HotMail or GMail server to send the email notification. When you select AOMEI Server, you only need to type into an email address which the program will send the execution result to. You don’t need to set the SMTP authentication. So, it will use AOMEI email server to send the email notification. When you use Custom Server, you can specify your own email SMTP server to send the email notification. SMTP Server: Specify the email SMTP server depending on your mail service. Port: Enter the port number of your email server, e.g. 465. Encryption: Support plain text, SSL and TLS. Of course, you also need to input your account for the SMTP authentication. when the operation is completed successfully. when the user interaction is required. Send email with HTML: the notification message will be encoded as text. Send email with TXT: the notification message will be encoded as html. If you use free edition, you can only choose HotMail or GMail. For other editions, you can use four SMTP servers: HotMail, GMail, AOMEI server or Custom server. All of theNotificationconditions for sending email notificationare selected in notifications settings by default. So you will get a report whether the operationiscompleted successfully ornot. For verifyingif your settings are correct or not. AOMEI Backupper will send a test message to your mailbox when you click“Send for test”. 1. Enable email notification during creating backup task, you are able to check “Enable email notification” in “General” of “Backup Options” in Backup page. 2. Enable email notification for the existing backup task in Home screen, click “Advanced” of the task, select “Edit Backup”, and then check “Enable email notification”.